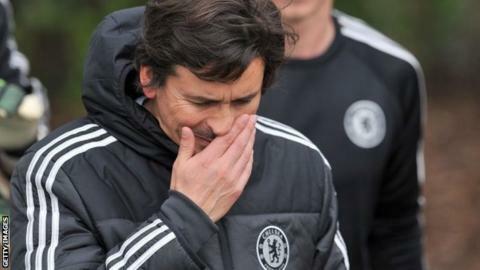 Chelsea assistant manager Rui Faria has been given a six-match stadium ban for his altercation with officials during the 2-1 loss to Sunderland. The Portuguese had to be restrained from confronting referee Mike Dean after Sunderland had been awarded what turned out to the match-winning penalty in the Premier League game on 19 April. He was sent off and later admitted two charges of misconduct. Faria, who has the right to appeal, has also been fined £30,000. His ban will cover Chelsea's two remaining matches this season - at home to Norwich and away to Cardiff - and the first four domestic fixtures next season. Chelsea manager Jose Mourinho is contesting his own misconduct charge following the defeat by the Black Cats. The charge relates to his comments congratulating referee Dean and Mike Riley, the head of the Premier League's refereeing body. Midfielder Ramires received a four-game retrospective ban following the same game after being found guilty of elbowing Sebastian Larsson in an incident missed by Dean. Faria first worked with Mourinho when they were both part of Louis van Gaal's backroom staff at Barcelona in 2000.